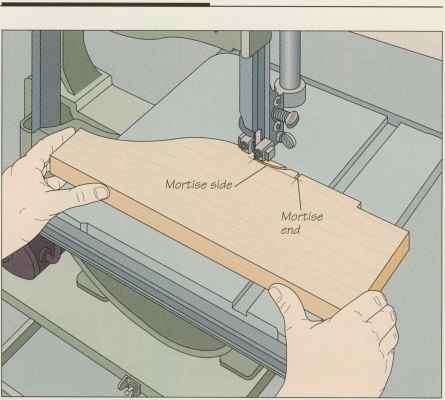 Join the leg halves with dowel joints. To prepare the legs for the dowels, drill two XA inch diameter holes, 1 inch deep into one half. Mark the opposite legs with dowel centers (see page 96). 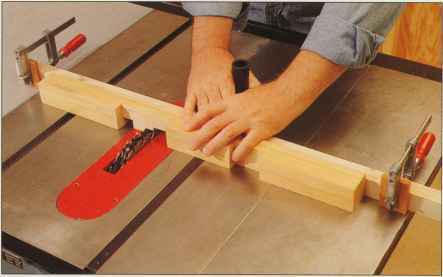 Position the tops of the legs against a straight edge such as a rip fence to make sure the notches will line up. Spread some glue inside the holes and along the straight edges of the legs. Push the two halves together (left) and clamp the leg with a bar clamp opposite each of the two glued edges (not opposite the notches).